This is from SpaceWeather…. very cool. I’ll bet this freaked out a lot of people… though there aren’t a lot of people up there. The twin rockets deployed two chemical tracers: trimethyl aluminum (TMA) and abarium/strontium mixture. 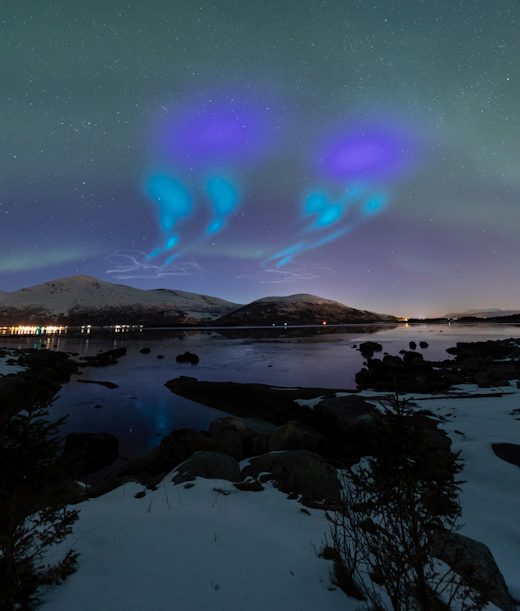 These mixtures create colorful clouds that allow researchers to visually track the flow of neutral and charged particles, respectively. According to NASA, which funded the mission, the chemicals pose no hazard to residents in the region. 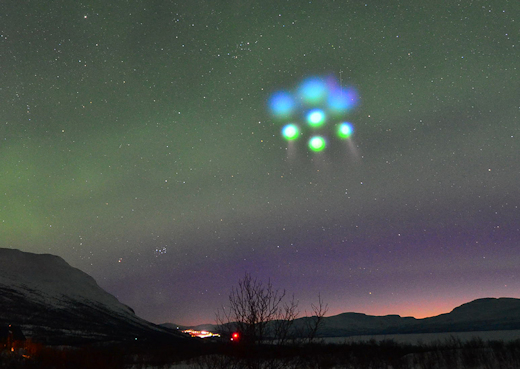 Aurora alerts: SMS text, email. Dear readers, this is an appeal. Your use of my links to stuff on Amazon or your use of my search box on the right sidebar provides important income. Every time you enter Amazon through my links or that search box, I get a small percentage of whatever you purchase. I cannot see who buys what. I have no idea who you are. Once you use my link or searchbox, you don’t have to keep going back to the link or searchbox for other things: Amazon remembers, during that session, how you got there. There is a reader who alerts me to purchases made for his workplace. He’s in charge of that, and he uses my searchbox to enter Amazon. If you are in charge of making orders, perhaps you could do the same. If you find something you want to get, highlighted the text of the item (Ctrl+C), and paste it into my searchbox (Ctrl+V). The percentage which I get per item is small. Many people with small purchases makes a huge difference over the course of a month. Take a couple more seconds to buy that gizmo. Come over to this blog and use my searchbox. The searchbox is toward the top on the right. Thanks for considering this. It is extremely helpful. This is a fine old tradition. It has to do with deprivation of the senses and the liturgical dying of the Church in preparation for the Lord’s tomb and resurrection. We do this to sense something of the humiliation of the Lord as he enters His Passion, something of His interior suffering. Today is Passion Sunday, the 5th of Lent. We are drawing closer to Jerusalem. Wait long enough and that hardly-to-be-imagined thing will happen. Holy Church has been at this Holy Mass thing for a really long time and in really diverse circumstances. Hence, she has been through a great many “What if X happens…?” situations. Wisely, and like the good mother she is, the Church used to tell us what to do, at least with general principles, so we could correct the situation and get on with it. Not to worry. Armed with first principles, priests know what to do! Take for example the recent Mass in Malta when the celebrant, Archbp. Scicluna, decided at the time of Communion that – surprise! – that was whiskey in that cruet and not wine. I guess the sacristan was storing the ALTAR WINE bottle along side the ALLT-A-BAINNE. I mean, if you squint and know the right pronunciation, hey! They’re pretty close, right? Of course, a sacristan would want to keep those bottles in a place where they’d be, you know, “safe”. So, the Archbishop gets a snoot full of Scotch – O Lord let it have been a single Malta – and informs the concelebrant… who immediately tried it! As one does. So, here’s is what is supposed to happen next. So, in this situation, having discovered that the stuff in the chalice was invalid matter, the celebrant should immediately require wine (and water) to be brought, probably with a new chalice, and a new host, and go through the two-fold consecration again. Of course this situation in the video is complicated by the fact that it is a concelebration. How do you do this discreetly to avoid scandal… never mind that it’s being televised and because of that damnable clip on microphone you are saying “Whiskey” to the whole world. Moral of the story. Don’t use clip on microphones! Or, if you do, be sure to say the proper vesting prayer when putting it on. Concede, Domine, virtutem labiis meis et prudentiam ad Tuam proclamandam veritatem, ut per indigni servi Tui vocem, vox Tui tonitrui in rota contremat terram. One more thing before we break for a drink. What constitutes valid matter, valid wine, for Mass? For this spirited question we Unreconstructed Ossified Manualists turn to, of course, Tanqueray! I am not ginning up a response to this important question. Tanqueray is really a writer of manuals of theology, in this case Tanqueray’s tonic for the soul the Theologia Dogmatica. It is of divine institution that the only valid substances for transubstantiation are, for the Body of the Lord bread made from wheat and, for the Precious Blood, wine made from grapes or raisins (dessicated grapes). But the grapes also have to be ripe, which rules out “wine” such as verjus (I actually have some, for ancient Roman and Medieval recipes). It can be red, white, dry, sweet, whatever. Some prefer red because it resembles blood. Some prefer white because it is easier to clean the linens. Sometimes questions come up about the use of wine which has very low alcohol content, called mustum, a wine which had the fermentation process halted by means of rapid freezing. That is a valid substance because it is from grapes and the natural fermentation process began, making it wine. It has an artificially low alcohol content, but mustum is consider valid wine. However, there is the other end of spectrum to consider: wine which has an artificially high alcohol content. Sometimes alcohol distilled from wine is added to wine in order to preserve it against spoiling, changing to vinegar. In this case we have “fortified wine”. The usual types of “fortified wine” we encounter are port, sherry, madeira, marsala, and vermouth. Long ago it was established that fortified wines are valid matter so long as the wine-spirit added was distilled from grapes, that the quantity of alcohol added, together natural content from the fermentation, does not exceed 18% and that the additional alcohol is added during the process of fermentation. Fathers. If you have any doubts about the wine, don’t use it! I would rule out vermouth, because herbs and so forth are added. I would not go for sherry because, if I am not mistaken, the addition of the spirits takes place after fermentation. Marsala seems to be okay, so long as it is 18% or less. Vin Santo, from dessicated grapes, is fine. As the name implies, it is wine for the altar! Port is valid, 18% or under. Furthermore, this is a good reason why there are ecclesiastically approved makers of altar wines. If you have a doubt, don’t screw around with anything that may not be valid. Lastly, back to that single Malta Mass. Do you suppose that the other cruet contained club soda? A couple days ago I received package from the nice folks at Preserving Christian Publications. “What”, quoth I, “could be in here?” Whereupon, I set it on the counter, got distracted and didn’t open it for a couple of days. “Oh yeah,” quoth I, while chopping veg for my soup. Whereupon, I opened it and found treasure within. They sent me a copy of their Liber Usualis, their Liber Brevior, and a new critter they made themselves, but which will be quite useful as we continue to recover our patrimony. See below. The “cheaters” are for scale. … and with ribbons, the Liber Usualis (“Useful Book”) having enough to cover your page changes for Vespers. I have an older Liber that I had rebound, having withstood the test of years. Of course it is as tight as the wallet of a Genovese arguing with Scots about the bar tab. This is the last edition before the massive disruption, the 1963 with the 1962 rubrics and Gregorian (not modern) notation. It has the rubrics in English, which some of you will find handy. It is updated with the changes. Note that they updated the Table to 2041. COST: $76 – which is well below other printings of the Liber you might find. This is not going to fall apart after a couple years of use, as many liturgical reprints do. They have added supplements for, say, the Immaculate Heart of Mary (22 August) and some other chants for Septuagesima, extra Alleluia for Easter Season, etc. The Liber Brevior is a shorter version of the Liber Usualis, the hours having been extracted leaving only chant notation for Holy Mass. Here is the new critter. Liber Hebdomadae Sanctae Cantus Gregoriani. This has all of the chant for Palm Sunday through the Easter Vigil, but not Easter Sunday. Hence, it has all of the office of Tenebrae. Friends, we must recover our Catholic patrimony. Preserving Christian Publications has provided some great tools of late. You might recall that I received and reviewed their 1962 Parish Ritual HERE. It expanded the Collectio Rituum (although it has one problem with the Divine Praises). I liked it so much I ordered a second copy for the sacristy. Those of you who want to form a schola cantorum… you have new resources. Gosh, how times have changed since the 80’s and 90’s. This last week saw the 50th anniversary of the “birth” of the Novus Ordo – after an unnaturally swift gestation – on 3 April 1969 when Paul VI promulgated the Apostolic Constitution Missale Romanum. Today I read for you, and I rant both before and after, an essay by Fr Hugh Somerville-Knapman, OSB, of Douay Abbey in Berkshire, England, called “The strange birth of the Novus Ordo”. It is published at the Catholic Herald, 4 April 2019. This essay drives home the incredible speed with which the liturgical changes were rammed through in the 1960’s. I also talk about our Catholic identity and the need for stability of our traditional rites and how that plays with the Novus Ordo as it is today and as it will be in the near future.